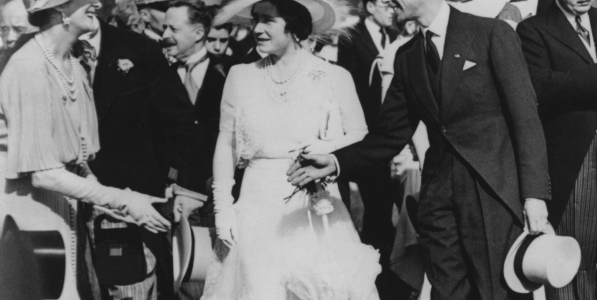 In the summer of 1938, consort Queen Elizabeth (later the Queen Mother) became a style icon on a state visit to France by tackling an old problem in a fresh new way. Most people don’t think of her as a style setter – the feathered hats and pastel dresses seemed out of date in her later years – but while she was never Duchess of Windsor chic, she definitely had her own unique style. One that took the fashion world by storm in 1938. The political climate was tense. Hilter’s power was growing and the leaders of France and England – historical enemies since the Hundred Years’ War six centuries earlier – agreed to meet for a state visit to see what they could do. Everything was set. The meetings. The social events. Then, five days before they were supposed to leave, the queen’s mother – the Countess of Strathmore – died. The trip was postponed for three weeks as the court went into mourning. The beautiful new wardrobe of pastels and florals the queen was going to wear was now completely inappropriate. Because in those days, even though things were much more lax than they had been during the Victorian era, full mourning attire was still required. Black for the first few weeks for an immediate family member, then half-mourning with touches of gray and mauve after that. None of which was suitable for the occasion or for July in France. 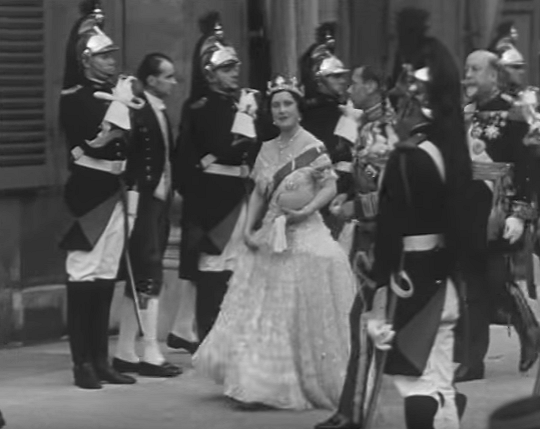 So the queen’s couturier, Norman Hartnell, did some research and came up with a solution: white. White had been the color of deepest mourning among medieval queens. The Queens of France had also traditionally wore mourning white. Queen Victoria had been buried in white. It was all perfectly acceptable. Queen Elizabeth agreed, and Hartnell and his staff got to work. They had two weeks to create 30 white outfits. On July 19th, the queen left England wearing mourning black…and stepped off the train in Paris a few hours later wearing mourning white. Over the next few days, in outfit after outfit, she sent the French fashion industry into a tizzy. Ephemeral, floating fabrics. Beautiful hats. 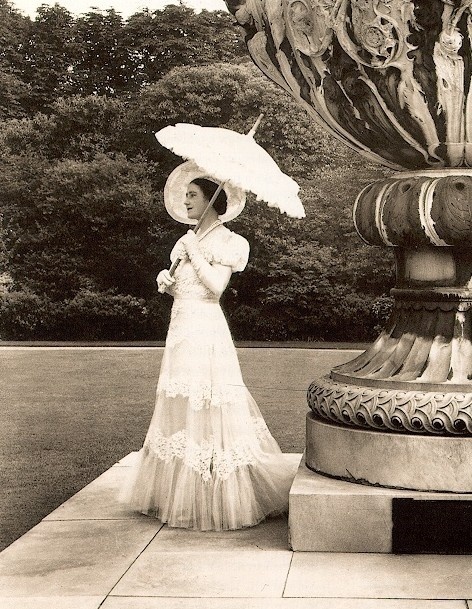 Lovely parasols. Everything she wore was talked about in detail by the press and in news reels. Women on both sides of the Channel were mesmerized. By all accounts, the White Wardrobe was a huge success. Queen Elizabeth became a style icon. Norman Hartwell received the Royal Warrant – and tons of new business. 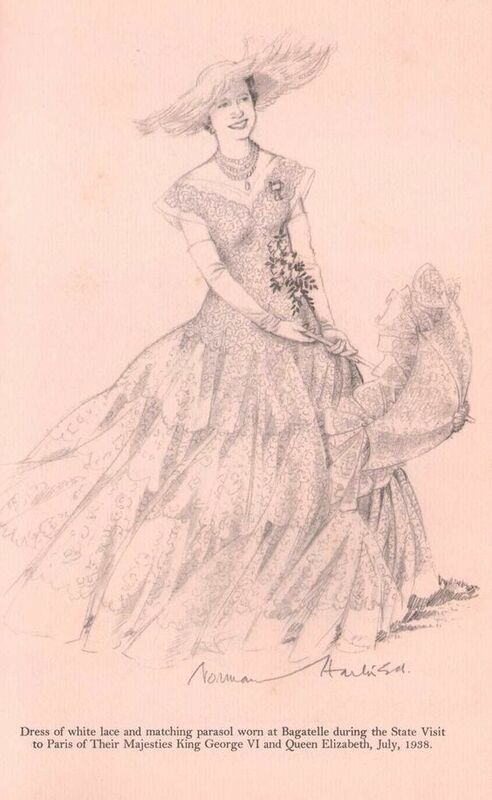 French designers copied the wide crinoline skirts and made it the new silhouette for evening wear. Yet the Queen never wore those clothes in public again. 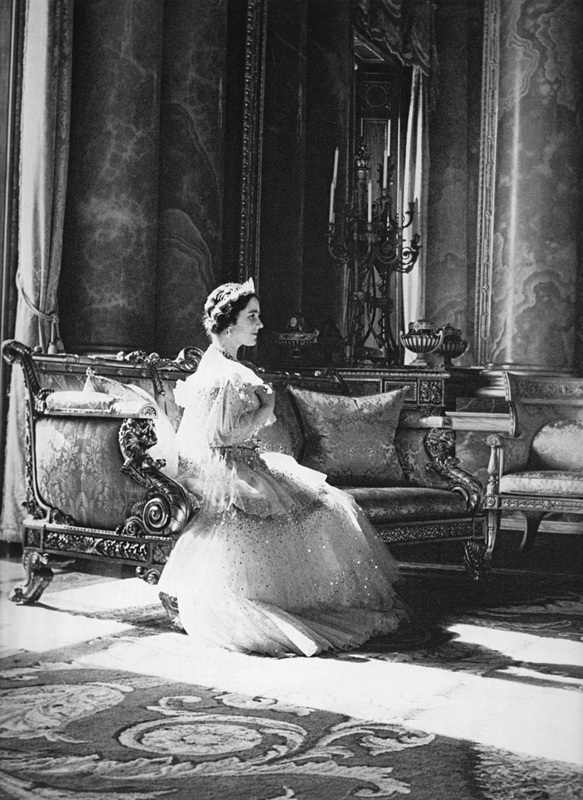 But she did have Cecil Beaton take photographs of her wearing them in Buckingham Palace. The romantic theme became her signature look. 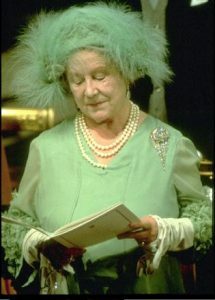 The Queen Mother died in 2002. When her staff cleared Clarence House – her home of 50 years – they re-discovered the White Wardrobe hidden in her closet archives. So in 2005, Buckingham Palace put the White Wardrobe on display for their summer tourist season, giving hundreds of thousands of visitors a chance to see the clothes one more time. I’ve been talking a lot about color in recent weeks, because it’s one of the easiest ways to breathe new life into your wardrobe. Most people are afraid of color. 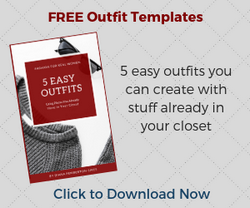 But if you learn how to use it correctly and appropriately, you can blow people away with your sartorial savvy, just as Norman Hartnell and Queen Elizabeth did nearly 80 years ago. It’s not hard. Just play around and see what happens.